It has been quite a weekend as the Home Secretary in the UK resigned (replaced by the first Muslim, Saeed Javid) and as our World continued to be ever so beset by challenges including the tragedy in Afghanistan that some 9 Journalists lost their lives in a new Daesh (ISIL) attack in Kabul. As this month is before us, please enjoy these "Random Thoughts" from the Grid as our team will continue to keep the daily curation of our Twitter Channel at hand with our key focus areas including The Near East (Middle East), China, India, Technology and Education--Onward!! 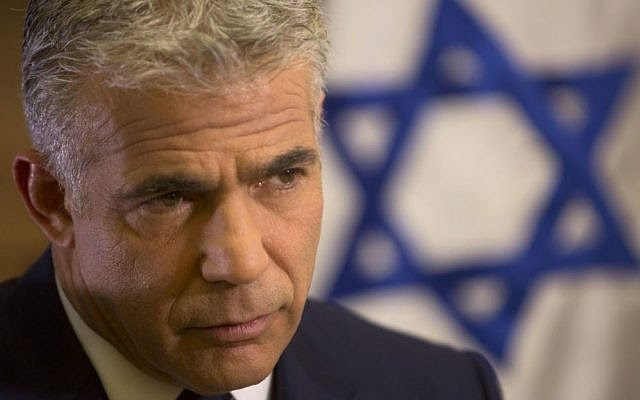 It has been quite a month in our World as May is bound to be even more colorful as we await President Trump's Decision on the Iran Deal, as the US Mid-Terms get into high gear and as we continue to be ever so engaged with our Mission throughout. This was also as the World was witness to the Summit of the Two Koreas. We agree that it masked the ugly nature of the North Korean Regime--but we are of the view that talking is better than shooting--and commitments that came out (albeit vague at times) is still welcome The image from the Muse above was cute as a Moment of Pause. Onward to May with all its' possibilities!!! Emmanuel Macron came to the United States. Earlier this week, we had the pleasure to feature his speech before Congress live as he also went against President Trump on Climate Change and the Iran Deal. However, what was disturbing was how Iran arrested an Dual National Academic during a visit to Iran as Macro fought for the deal. 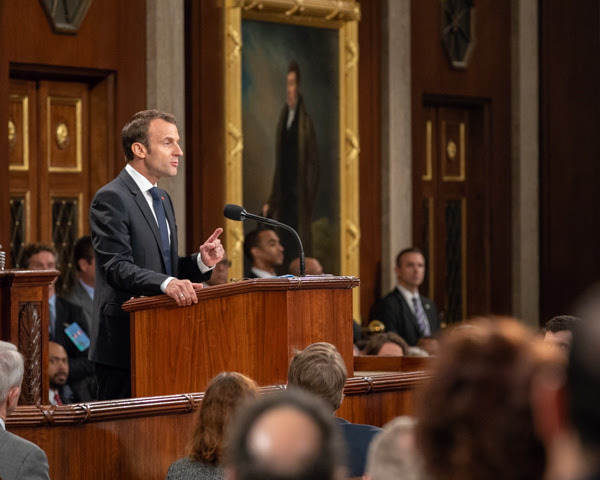 This morning, a time-honored tradition took place as President Emmanuel Macron became the eighth President of France to address a joint meeting of Congress. 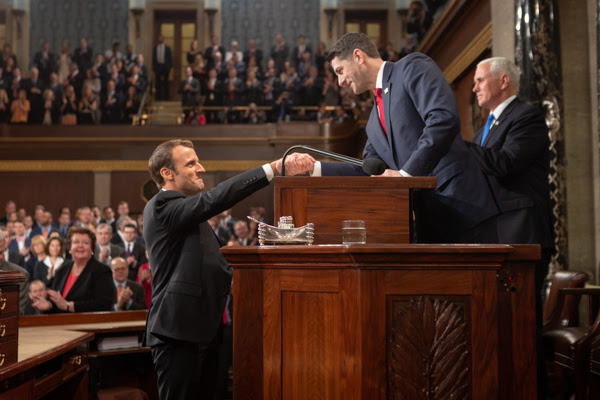 The United States' partnership with France dates all the way back to our nation's founding, and Speaker Ryan welcomed President and Madam Macron to the Capitol in the spirit of our longstanding friendship. 1. 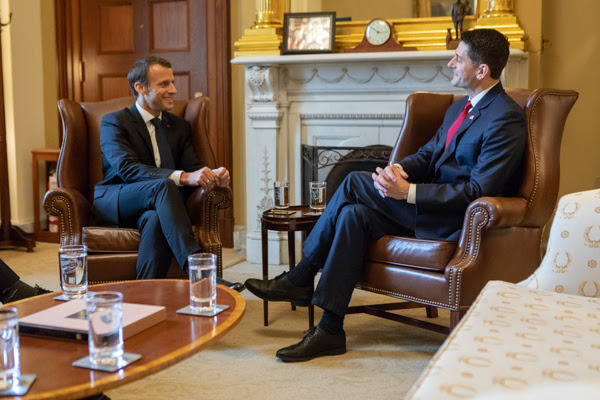 Speaker Ryan and President Macron sit down together moments before the joint meeting begins. 2. Speaker Ryan welcomes President Macron to the Hall of the House to address a joint meeting of Congress. 3. The first foreign dignitary to address the United States Congress was also French: General Marquis de Lafayette, whose portrait hangs in the House Chamber as seen in the photo below. 4. 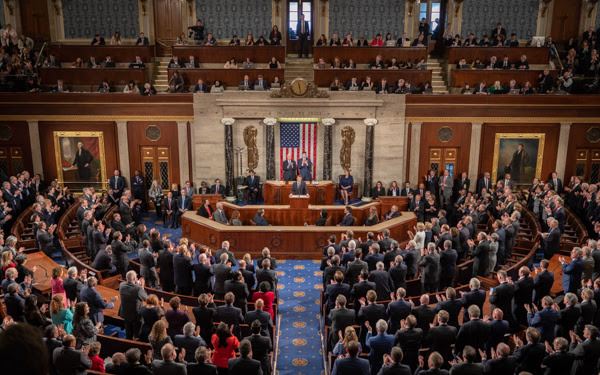 President Macron receives a standing ovation from the United States Congress. 5. 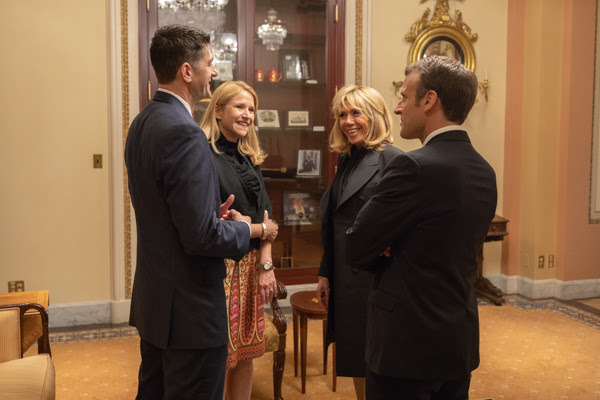 Speaker Ryan and his wife, Janna, bid farewell to President Macron and his wife, Brigette. 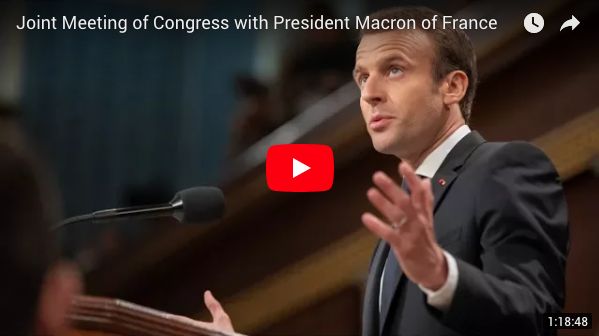 To watch President Macron's full address to Congress, click the video below. We shall be bringing you the Africa Political Digest here. A powerful 52 minutes we are pleased to share and thank ABC News for posting this earlier today. Emmanuel Macron and his wife have arrived in the United States. As Emmanuel Macron continues to press Donald Trump on the Iran Deal, we also understand that no Democratic Members of Congress have been invited to the State Dinner. According to reports, indications are that President Trump will ax the deal and Hassan Rouhani has already said that there will be consequences. It has been quite a weekend as our team continued to keep pace with our World with the problematic nature of the Trump Presidency epitomized by this recent cover of Time Magazine. In addition, there was the continued backlash in the aftermath of the Comey Memo leak. Beyond that, there were reporting about how President Trump lied to get on the Forbes 400. 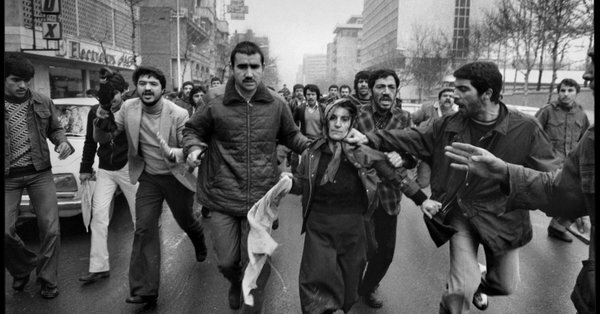 It is also interesting that the weekend saw finally a major figure in Iran, Saeed Mortazavi, arrested. He had been hiding in the North of the Country and his "disappearance" had caused a lot of laughter throughout the Country as he was on the run after having been convicted of felony murder and other charges. This is as Iran continued to be in a stage of outrage in the aftermath of the beating up of the young lady the streets of Tehran by the Morality Police. This is as there were protests in Armenia, South Africa and Nicaragua--to name a few. This is also as North Korea said it will stop its' nuclear program in anticipation of a summit with the South Korea and an apparent upcoming summit with Donald Trump. This is also as the War in Syria, Afghanistan, Iraq and Egypt railed on--and there was a suicide bomber that attacked a Voter Registration Center in the Afghan Capital. Welcome to Earth Day Week-End. Our Community, Laguna Niguel, is celebrating Earth Day by working at one of the secret gems here in our Community: Niguel Botannical Perserve. 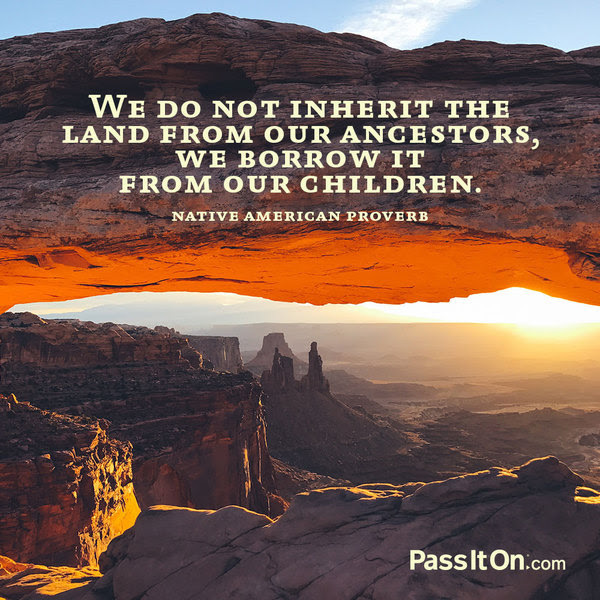 It is a reminder to us all that we have one Earth. The need to protect it and insure that lives are saved is the responsibility of each and everyone of us. As we deemed this weekly "The Battle For Paradise", there needs to be a realization that our entire Earth is Paradise. If humanity could capture just one part of 6,000 in available solar energy, we’d be able to meet 100 percent of our energy needs. We’re about to enter an age of energy abundance. This year, Peter brought Ramez Naam to Abundance 360 to explore how converging exponential technologies will reshape the energy industry in the years and decades ahead. Naam spent 13 years as a Microsoft executive, and now heads the Energy track at Singularity University. He is a brilliant speaker, an acclaimed science fiction writer and one of Peter’s dear friends. As the video notes, the poorest countries in the world are also the sunniest, which means that the entire planet will benefit from the coming energy revolution. 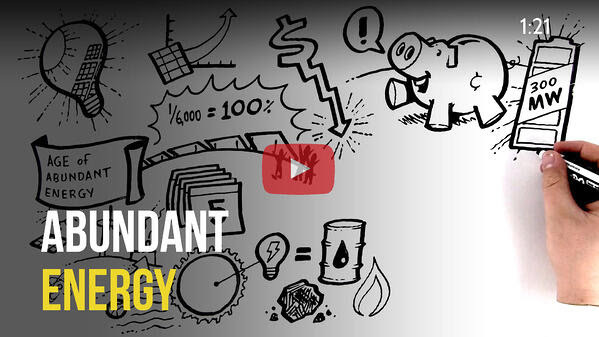 Energy is a $6 trillion per year industry, and it’s ripe for disruption. In his A360 remarks, Naam explained how the price of solar will further plummet while efficiency and accessibility will dramatically improve. Peabody, the largest private sector coal company on Earth, went bankrupt in 2014, about three years after its peak. In 2017, China canceled plans for 151 coal power plants -- some $80 billion of planned projects that will no longer happen. India canceled almost $9 billion of coal plants in a single month (June 2017). Shell Oil predicts that peak oil demand will arrive sometime between 2021 and 2029. Over the past 40 years, the cost of solar panel materials has dropped 250x as a result of innovations in materials science. Where: Tucson, Arizona. Cost: 4.3 cents/kWh. Where: Chile. Cost: 2.91 cents/kWh. Where: Mexico. Cost: 2.7 cents/kWh. Where: Abu Dhabi. Cost: 2.42 cents/kWh. The 2.42 cents/kWh deal signed in Abu Dhabi is the lowest unsubsidized cost per kWh ever signed anywhere in the world. And with the anticipated convergences of machine learning, quantum computing and materials science, exponential improvements in solar panel materials will only accelerate. The digitization of solar technology improvements is clear. The materials science of solar is a close cousin to that of computation: both rely on semiconductor and thin film technologies at their core. With an exponential price decline in solar material cost, what other innovations must happen to truly approach dematerialized solar? Currently, the amount of solar installed each year increases by 35 to 40 percent. Considering this growth, we’ll see secondary and tertiary accelerants to the already exponential nature of solar. While robotic and automated solar trackers have been part of solar construction for some time, robotic labor and maintenance are about to disrupt the industry. One megawatt of solar power is estimated to require 8 acres of land. U.S. solar capacity is on the order of 3,000 megawatts (only 0.65 percent of U.S. power produced), about 24,000 acres of solar-covered land. Extrapolating the 8-acre-per-megawatt estimate to a time when solar dominates 10 percent of U.S. energy, and we’ll need over 1.6 million acres of solar installations. 1.6 million acres is a lot of land to cover and maintain -- for humans. Solar farm robots will range from autonomous solar-panel-installing trucks to robotic solar panel technicians and surveillance drones and sensors detecting broken panels. Removing the added cost of labor associated with laying acres of solar panels will be a secondary accelerant to lowering the cost of solar. A tertiary accelerant happens when we can use renewable energy overnight and during inclement weather. The utility of renewable energy generators is ultimately linked to our ability to store the harnessed energy. Exponential advances in renewable technologies will converge with exponential advances in storage technology. We’re in the middle of an energy storage shakeup. To contextualize how rapidly storage technologies are improving, lithium-ion battery costs have dropped 5x over the past eight years. Battery prices are decreasing at nearly the same rate as solar prices decreased, but a decade later. Peter often says that we are living in the most opportunity-filled time in human history. An abundance of energy enables an entirely new era of innovation, with untold implications on everyday life and the global standard of living. As you may be aware, some national organizers are again calling for a student walkout – during school hours tomorrow, Friday, April 20th. This walkout is reportedly intended to call attention to school violence and issues of gun control. According to the information we have, students are first being asked to leave class at approximately 10:00 for thirteen minutes (in memory of the 13 students who died in the Columbine High School shooting in 1999), and then to also leave campus for the remainder of the day and attend various community protest events. We ask for your support in reminding students that they should NOT ever leave campus without first following proper attendance callout procedures. Our district communications office in March previously sent all CUSD families and staff a letter outlining important information and key points, which will again serve as the foundation for what we will do at ANHS if we have students who choose to participate in this walkout. While we deeply value each and every one of our student's voices, we are not sponsoring nor endorsing participation in this or any demonstration. However, our student's safety will always be our highest priority and we have a plan to ensure we are doing everything we can to keep our students safe in the event they choose to walk out. Below you will find guidelines that we will be following at ANHS, many of which were outlined in the previous communication from me and our district office. We will direct any students who choose to walk out to a supervised location on campus; students should NOT leave campus for any reason. Students do who leave campus without first following proper attendance callout procedures will be marked truant and subject to disciplinary consequences. If a student chooses to walk out of class they will not be prohibited or blocked from doing so in any way. Students will not be forced or pressured to participate in the walkout by any teacher or school employee. We ask that all students, regardless of whether they choose to participate or not, are respectful of each other's choices and views and continue to help make ANHS a safe, supportive, and accepting community for all students. As always, thank you for your support of our students and school. While CUSD supports the rights of our students to express their beliefs under the state and federal First Amendment rights, as a District we are not sponsoring or advocating any participation in demonstrations. Supporting the remarks by the California State PTA, “care must be taken to ensure that orderly operation of the school is not disrupted and the physical safety of students is not threatened.” We have all agreed that our focus will remain on instruction and learning and to keep students safe in classrooms. All activities must be peaceful and respectful. At no time may students leave the campus. Additionally, a student may be marked truant if they do not return to the classroom or if they leave the campus. We continue to encourage parents to have a conversation with their students and to make their own expectations clear about participating in student demonstrations and these non-school sponsored activities. Principals and school staff who have been approached by students should continue to talk with them about this matter and maintain open lines of communication with parents. To further support a safe campus environment, outside groups, parents/guardians, and other individuals who do not have official school business will not be allowed on campus to participate in the walkouts. As part of our normal operations, anyone visiting school campuses for school-related matters or for volunteer work must check in with the front office. We are committed to the safety of all of our students and desire to assure staff, families, and students that our site staff will work tirelessly to create a positive, supportive learning environment on all of our campuses in the event of any student demonstrations. Our priority is student learning and safety. What we expect this month from our students will ensure that our students understand future expectations, as many other walkouts are being planned nationally. The Commonwealth Head of Government Meetings has opened in London as the UK will assume the leadership--and as the Queen has nominated her principal heir, Prince Charles, to succeed her as Head of the Commonwealth. What particularly caught our attention was the thoughts shared by a Young Man From Sierra Leon and a Lady from India. We salute all the fallen and their families as we remember them in our thoughts & prayers. On behalf of all of us at the Daily Outsider, we wish to express our appreciation to the great Stevie Wonder for this beautiful 5 minutes as we say that the Dream Still Lives. Our mission is to help to do whatever we can to sustain this Dream--and that we shall!!! We will be dark in our properties over the ensuing days as we hope all enjoy our Broadcast Partners and our Twitter Channel Updates. 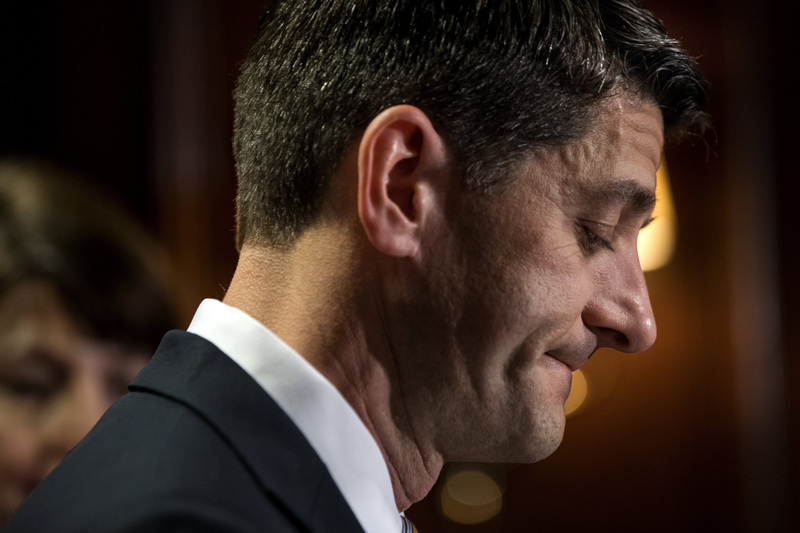 House Speaker Paul Ryan will not seek re-election, NBC News confirms. NBC’s Garrett Haake and Kasie Hunt report on how the House Speaker’s decision to not seek re-election will affect the Republican Party in Congress. there was not more of an uproar over the massive budget just passed after lifting debt ceilings by both parties. Now, the Congressional Budget Office is projecting that the combination of the new tax bill and our massive budget will push the national debt to nearly the same size as gross domestic product by 2028. That is with an economic growth rate of 3.3 percent this year. It has been quite a weekend as President Trump spoke up for Scott Pruitt, Trump Officials went on The US Public Affairs shows to defend the President's Tariff plans and the President called out Putin by name in the aftermath of the Horrific Chemical Attack on Syria--and this is as the President went after the Justice Department and the FBI. Facebook, in the meantime, is in the cross hairs in the aftermath of the Cambridge Analytica fiasco--This reporting last week from the Washington Post was troubling as all who use it may have been compromised--some 2 Billion Users. The Top Two Facebook Executives made the media rounds to note how "sorry" they were. Mark Zuckerberg, the Facebook Founder, Chair and CEO, is due to appears before Congress on April 10. Our team maintains a presence on Facebook as we feature periodic updates on our curation of the World's On-going Media--and will continue to do so. EPA administrator Scott Pruitt was adamant in his disastrous interview with Fox's Ed Henry that he was unaware of the controversial raises given to two aides and that he attempted to find out which officials were responsible. The interview not only did not sit well many viewers, it clearly did not sit well with people at the EPA and the White House. The Washington Post is reporting that he personally instructed agency staff to approve raises for two top aides who had previously served under him in Oklahoma, The Post reports that two EPA officials and a White house official confirmed that Pruitt not only knew of the raises but instructed underlings to approve them. California reached a milestone recently in its immigration laws: the state has now given over one million illegal or undocumented immigrants driver's licenses. Passed in 2013 by sponsor Luis Alejo, Assembly Bill 60 required the California Department of Motor Vehicles to issue driver's licenses to undocumented immigrants as long as they can prove their identity and residence within the state. 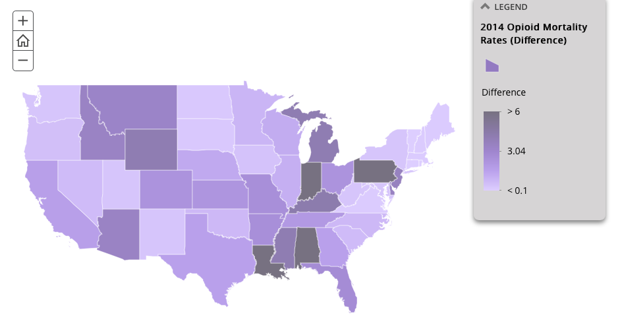 As of March 31st, some 1,001,000 undocumented immigrants have received licenses. The state has reached this goal at a time when it is on a collision course with the Trump Administration on immigration enforcement as well as some of its own cities. The result is rising rhetoric on both sides and an inevitable court fight. President could face lawsuit if he withholds funds without congressional approval.